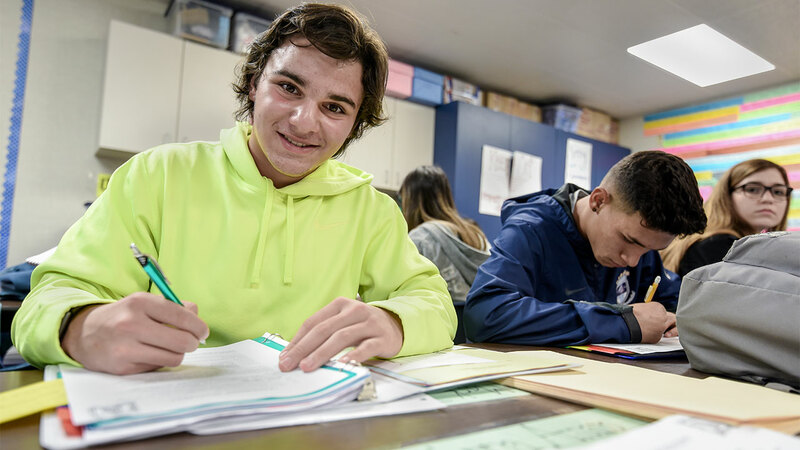 Bullard High School sophomore Mark Topoozian's desire to give back to his community led him to launch a volunteer club at his school and lead an effort to get unopened school lunch packets to senior citizens in need. Mark is among the hundreds of Fresno Unified students who volunteer in a variety of ways to help others and make their community better. Mark's efforts at Bullard started last year as freshman class president. He and other ninth grade officers organized a Christmas toy drive and donated more than 100 toys to patients at Valley Children's Hospital. This memorable experience sparked Mark to launch a community service club this school year for students at Bullard called The Drive. The goal of the club is to organize student volunteer projects through the school year. It's open to all students. The Drive packed holiday meal boxes at the Community Food Bank for those in need earlier this school year and the club has a variety of other projects planned and in February delivered Valentines cards to residents at the California Armenian Home skilled nursing facility. Mark, sophomore class president this year, hopes The Drive will encourage his peers to give back: "Students want to get involved, but they just don't know how to go about it." Mark is also helping to make sure unopened lunch food from Bullard High does not go to waste. Earlier this school year, he noticed that many students were tossing lunch packets in the trash and wanted to find a way to share the food with others. Thanks to Mark's determination, Bullard is the first high school to be part of the Food Recovery Program, a partnership established in 2013 between Fresno Unified and the Community Food Bank. Unopened lunches from Bullard are now transported daily to residents at Masten Towers, a low-income housing complex for senior citizens in downtown Fresno. The food goes to between 75 and 200 people a day. Mark said his passion to give back to his community was inspired by his parents. From a young age, Mark saw his parents volunteering in the community in a variety of ways, including serving on numerous committees and boards. Mark developed a heart for senior citizens while volunteering at the California Armenian Home. He helped residents with their cognitive thinking and social skills. Mark said as he got older and became more aware of his broader community, he was shocked at the high number of people living in poverty and on the street. "When I see homeless people, I want to give back," he said. As part of his involvement in student leadership, Mark was among a group of selected Fresno Unified leadership students who attended the California Association of Directors of Activities (CADA) leadership camp at UC Santa Barbara last summer. In addition to leadership activities, he plays baseball for Bullard and holds a black belt in karate. He is also a member of the Fresno Junior Chamber of Commerce and volunteers at Valley Children's Hospital. Mark is a 4.0 student and hopes to earn a scholarship to play baseball at a major university in California. Because of his passion for helping others, he plans to major in biology or chemistry and is hoping to pursue a career in the medical field.